More than 90 million people struggle with chronic bad breath. Typically, poor oral hygiene habits leave decaying food particles, other debris, and bacteria in the mouth. These can produce volatile sulfur compounds just like those found in rotten eggs, resulting in foul-smelling breath. 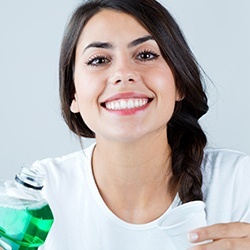 Chewing gum, mints, and normal mouthwash usually aren’t enough to cure halitosis. Bad breath is also one of the main symptoms of a serious underlying periodontal condition: gum disease. Many patients who come to us for help with halitosis don’t realize they actually have some form of gum disease. Although gum disease is terribly pervasive, it's also preventable. Whenever you visit our office, we will carefully check for the warning signs of gum disease: red, swollen, tender, or bleeding gums, gums pulling away from teeth, loose or separating teeth, pus between the gum and tooth, bite changes, and/or a change in the fit of dentures. If you do indeed have gum disease, treating it may also cure your halitosis. Internal infections, diabetes, kidney failure, liver malfunction, and radiation treatment for cancer can contribute to halitosis as well. Lifestyle conditions such as stress, dieting, snoring, advanced age, and hormonal changes may also stimulate bad breath. Regardless of the cause, bad breath/halitosis is treatable even if it is not associated with gum disease. First, institute effective oral hygiene including regular professional cleanings, brushing twice each day, daily flossing, and tongue cleaning. Consistent tongue cleaning with a specially designed scraper will remove bacterial build-up 10 times more effectively than a toothbrush. If meticulous hygiene is insufficient at eliminating your bad breath, invest in a professional breath kit such as the CloSYSII (available at www.closys.com), which includes a specially formulated toothpaste, a chlorine-stabilized rinse that destroys those odorous sulfur compounds for up to 5 hours, and tongue scraper. Most people notice an immediate improvement. If you need help getting rid of your bad breath, don’t worry, you’re far from alone. To schedule an appointment, contact us today.